Bats – Bat removal, Bat guano. Bats in the Attic VA.
How to get rid of bats is one of the most common questions we receive from Virginia callers. Don’t bother with a bat repellent, they simply don’t work. Getting rid of bats is our specialty. If you have bats in the attic, bats in the gable end vents of your home, or a bat flying around inside your Virginia house, we can help safely and humanely remove the bats and get rid of them to restore your peace of mind. Bats are commonly found roosting in gable end vents, under the siding of a home, behind shutters, in attics and in the eaves of homes and businesses. You should never hire any company that offers to trap bats or spray fumigants to remove and control bats. These processes may be harmful to you, your family and the bats that are important to our ecosystem. Bat exterminator pest control is also not a viable option and may be illegal in Virginia. Bat in house removal services is our specialty. Virginia Professional Wildlife Removal Services is the ONLY area bat removal and bat control company where all of our employees have received training in NWCOA Bat Standards AND WCT Training Group Bat Management Course. We perform bat exclusions, the removal of an individual bat, bat colony removals, bat feces identification and removal, and bat guano (bat poop) removal and clean-up services throughout the State of Virginia – including Richmond, Charlottesville, Goochland, Louisa, Fluvanna, Orange, Albemarle, Powhatan, Amelia, Short Pump, Glen Allen, Chesterfield, Chester, Midlothian, Bon Air, Woodlake, Brandermill, Colonial Heights, Ashland, Mineral, Gordonsville, Earlysville, Keswick, Henrico, Chesapeake, Hampton, Harrisonburg, Luray, Newport News, Norfolk, Portsmouth, Roanoke, Rockingham, Salem, Shenandoah, Virginia Beach, Williamsburg, Yorktown and Hanover. Have bats in your attic, bats in chimney, bats in your vents or a bats in your house? No Problem. Virginia Professional Wildlife Removal Services is registered with and recommended by Bat Conservation International as Bat Exclusion Professionals. Our personnel view bats as the beneficial animals that they are, and make every effort to exclude bats from buildings in a safe and effective manner. They are also knowledgeable and experienced with safe bat guano clean-up techniques and procedures. We are constantly striving to advance our education so that we may serve you better. If you have a bat colony in your attic, call us today to schedule a site visit for bat control in Virginia. We can safely remove the bats from your home, and make sure that the bats do not return. We normally do not perform bat exclusions during the bat birthing period of May through July. There are exceptions, so call us for details. A bat in your house? First, if possible isolate the bat to one room, then call us and let us remove the bat for you. If the bat has made contact with any person or pet, it will need to be tested by the Virginia Health Department for rabies. There are 17 species of bats in Virginia. Three (Gray Bat, Indiana Bat, and Virginia-Big-eared Bat) are federally endangered. 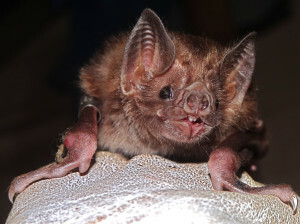 One, the Rafinesque’s Big-eared Bat, is state endangered, and the remaining 12 are non-game protected species in Virginia. The Big Brown Bat, Evening Bat, and Little Brown Bat are the three bat species in Virginia that are most likely to take residence in a building. If a bat is found indoors with people, the Virginia Department of Health recommends having the bat captured and having it tested for rabies. While less than ½ of 1% of all bats actually carry rabies, this is a time for caution. Heavy leather work gloves should be worn if you must handle the bat in any way. Bats and their droppings (bat guano or bat excrement) should only be removed by a licensed, trained and Virginia State Certified Bat Control Company. If you have an area with a large buildup of bat guano (droppings) and you must be in the contaminated space, immediately put on gloves and something to cover your nose and mouth. 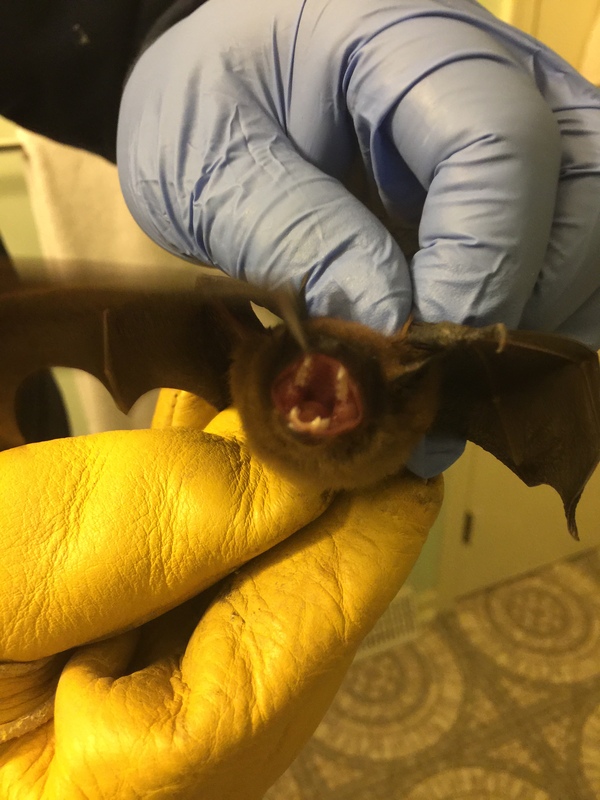 Bat droppings can harbor histoplasmosis fungi spores and should be cleaned up by a professional Wildlife Removal and Animal Control Company in Virginia. Bats are able to squeeze through narrow slits and cracks. For purposes of bat management, one should pay attention to any gap of approximately 1/4 x 1 1/2 inches (0.6 x 3.8 cm) or a hole 5/8 x 7/8 inch (1.6 x 2.2 cm). Such openings must be considered potential entries for at least the smaller species, such as the little brown bat. The smaller species require an opening no wider than 3/8 inch (0.95 cm), that is, a hole the diameter of a US 10-cent coin (Greenhall 1982). Openings of these dimensions are not uncommon in older wood frame structures where boards have shrunk, warped, or otherwise become loosened. Log cabins are also favorite roosting sites for bats looking for safe harborage. Because of their design, log cabins have many gaps and openings that allow for easy entry for bats. Sometime these log cabins have missing chinking or the entire log cabin may need to be re-chinked using only the best chinking materials available. We can help, our bat experts can bat proof your log cabin, home or business so that bats cannot reenter the structure. Because of the possibility of contracting histoplasmosis, the clean-up of all bat feces should be left to trained professionals who have the expertise and equipment necessary to remove bat dung safely. Read our article on Bat Guano Removal & Disposal. A. Yes, these two problems are related, but chances are you have Bat Bugs instead of Bed Bugs. Bat Bugs are a ectoparasite that be found on Bats, in guano, areas where there has been bat colonies, or around roosting areas where bats congregate. They look exactly like bed bugs, and only the trained eye can distinguish the two. Infestations can be very minor to very major problems. Once bats are removed or happen to take up a roost elsewhere, ectoparasites like bat bugs can start searching throughout the home for a new host. If you notice activity like this call one of our Virginia Bat Removal Control specialists immediately. We receive dozens of calls each week from potential customers who have questions about bats and the removal process in Virginia. Some of the questions asked include: Do we do bat eradication? How do you go about removing bats in my attic? Is there a process involved with removing bats from attic? Is it expensive getting rid of bats in attic? How to get rid of bats in your house? Is it serious if you have bats in your house? Within this website we have tried to answer these questions and many more. We hope that you have found the information on helpful. A. One of the first questions we get asked by potential customers is, What does it cost to remove bats from the attic of my Virginia home. The truth is, no two bat jobs are the same, so the cost can vary significantly from one job to the next. We often tell callers that any company that gives you a cost for bat removal without first conducting a site visit or assessment has not a clue what they are doing. You should stay away from these so called “bat experts” and remember Buyer Beware. Q. What is the normal bat removal cost? A. Because there are so many variables in bat remediation, the cost for a complete bat job including sealing entry points and repairs necessary to keep bats out can range from a few hundred dollars to several thousand dollars. Q. DIY bat removal – How do I do it yourself? A. Bat removal in Virginia requires a great deal of expertise. We do not recommend that amateurs attempt to remove bats. We also do not recommend hiring a pest control company to remove bats. The process should only be performed by Wildlife Removal companies who have professionals on staff that are trained in bat biology and behaviors, and understand the correct procedures and processes for humane bat removal, bat proofing, and bat exclusion. Q. What is a good bat deterrent? A. There is nothing that has been proven effective as a bat deterrent. Q. Are bat traps effective? A. Years ago some bat removal companies actually used bat traps. With the spread of White Noise Syndrome (WNS), a fungus lethal to bats, this practice has all but been abandoned by reputable companies. You should stay far away from anyone who suggests using a bat trap. A. Bat repellent sprays, bat repellent devices, bat repellent sounds, and natural bat repellents are a waste of money. There are no know bat repellents on the market that have been proven effective in repelling bats from attics or other places in your home. Be careful of gimmicks whose sole purpose is to separate you from your hard earned money. Bat repellent spray and other bat repellent formulations simply do not work. A. Yes they do! The two most common species of bats in homes is the Little Brown Bat and the Big Brown Bat. Both species have a lot of sharp, tiny teeth. If you try to handle them there is a good chance that you will be bitten. Q. What does a bat nest look like? A. Bats do not have nests. They are very social animals and usually live in colony groups. Q. How do I keep bats out of my home? A. The best way to keep bats out of your house is my closing off all entry points 3/8″ or greater. Bat proofing homes is an important part of the bat extermination process. (We don’t really exterminate bats, they’re great for our eco-system). Q. What are some bats in attic signs? A. Some of the signs of bats in an attic include the presence of bat guano (bat feces), a dark brown staining near the bats entry point, the presence of bat urine, the sounds of bats (bat noises), and the presence of bat bugs (similar in appearance to bed bugs). A. The types of devices used for removal and control vary. Some devices can be used in many different situations, while others have very limited uses. Q. Do you perform residential removal? A. Yes, our bat technicians are experts at residential, commercial and industrial bat removal. We perform bat removal and bat control services throughout Virginia. Q. How do you catch a bat inside a house? A. People often want to know how to catch a bat that has gotten into the living space of a home. The following procedures work best in catching bats. First, watch the bat, and wait for it to land, then drape a towel over it and bunch it up in the towel, then call your local animal control officer to have it picked up and tested for rabies. Secondly, if the bat lands on an unobstructed wall or floor, place a plastic container over the bat, then slide paper under the container to trap it. Lastly, open windows and doors and wait for it to fly out (might not work very well, but worth a try). This is generally not recommended because you lose the ability to test the bat for rabies and it will probably reenter the home at its normal entry point. Q. Removal products – what are the most common? A. There are many different types of products available to professional bat removal companies. They include bat nets, bat pipes, bat venting devices, one way valves, and other bat exclusion tools and equipment. Many people think that we actually catch the bats. We are many things, but a bat catcher we are not. Q. Can you remove bats during the wintertime? A. Bats cannot be removed during the winter. Click here to find out why. Q. How do bats find (locate) my house year-after-year? A. We are often asked, How do bats find places? The animals recognize places by remembering how they sound, a new study suggests. How bats navigate at night while foraging is pretty well understood. They use echolocation, emitting high-pitched sounds and then using the return echoes to perceive objects mapped out in their midst — from trees to boulders to tasty insects. But the ability to follow a route — say to a roosting spot or favorite feeding site — requires recognition of places along the way, and what’s not so well understood is how bats use echolocation to manage that feat. Researchers from the University of Bristol and the University of Antwerp thought bats might be using a kind of template-based system for navigation, in which places were remembered by specific echo signatures instead of 3-D echolocation layouts, so they set out to test the idea. How do you test whether bats likely use echo signatures as place templates? The scientists in this study built their own bat, one complete with ultrasonic microphone “ears,” speaker “mouth” and computer brain to store measurement data. The researchers collected calls and echoes their artificial bat made over different types of terrain and then analyzed what kind of sonic templates might emerge. It turned out that the echoes returned from each place to their fake bat were indeed unique enough to be considered templates that represented specific locations. “Importantly, our method used the echoes without inferring the location or identity of objects, such as plants and trees, at each site,” noted study co-author Dieter Vanderelst, of the University of Antwerp, in a statement. The types of terrain over which their artificial bat “flew” varied between lush, leafy parks and gardens in the UK and stony, more spacious lands of a park in Israel. The different terrain setups helped the scientists observe that stronger, more recognizable features, such as boulders in the park in Israel, returned more recognizable echo signatures and that such features could serve as landmarks for the animals on their journeys. Q. I need bat removal and bat prevention services in Virginia. What should I do? A. First, never try to remove bats yourself. Too many things can go wrong. Secondly, NEVER hire a pest control company to perform bat removal. Pest control companies are experts in bug control, not bats. Lastly, when looking to hire a bat removal company in Virginia, make sure they have received advanced training and are NWCOA Bat Standards Compliant. Removing bats from a home or attic is not like trying to trap a squirrel, it requires a thorough knowledge of bats and their behaviors. We understand the importance of education, training and experience when in comes to dealing with bats. That’s why all of our bat removal technicians are double certified, having successfully completed bat training from two separate bat training entities – NWCOA AND WCT Training Group. Q. We are often asked, Can bats be removed from homes or businesses in the Winter? A. The short answer is no. You should not try to remove bats during the Winter. We’ve written a great blog post on Wintertime bat removal. Read our opinion on Wintertime Bat Removal and why it’s not a good idea. As much as it pains me to say so there are a lot of unscrupulous people out here proclaiming that they provide exceptional bat removal services. Unfortunately, that is just not true. At the present time, the Commonwealth of Virginia does not even require special training or licensing to perform bat work – they should. And hiring a pest control company to perform bat removal services is generally never a good idea. Did you know that throughout the entire United States, only about 400 people attend the National Wildlife Control Operators Association annual training conference? And in Virginia, only about 25 people attend the annual Virginia training conference? Sad, but true. Not to worry though. As far as I know we are the only Bat Removal Company in Central Virginia where all of our technicians are Bat Standards Certified. Read the articles on NWCOA Bat Standards and Code of Ethics and Why We Should Have Bat Standards to find out why this is important. Bats are such an important part of our ecosystem in Virginia. If you want to help preserve bats and increase their chance for survival, building a bat house is a good start. We also do bat house installations. NOTE: The Little Brown Bat is on the verge of being listed as an endangered bat species in Virginia. To help protect this bat it is important to hire a bat company that is properly trained in identifying and protecting the Little Brown Bat which is so important to our ecosystem. Safe & humane wildlife removal from homes & businesses. We get rid of bats, birds, squirrels, raccoons, mice, rats and many more critters safely & humanely. We provide safe, humane and hassle free bat removal services throughout the Richmond, Virginia AND Charlottesville VA areas. NWCOA Bat Standards Certified. Bats in attics are our specialty.